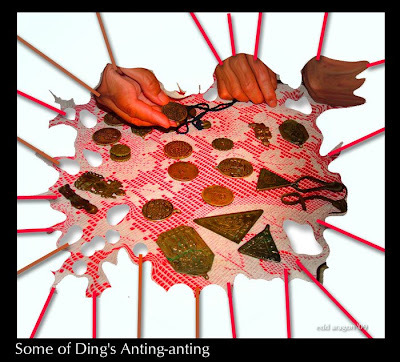 edd aragon blogs.on: Oh Nine! Happy 09-09-09 everyone! 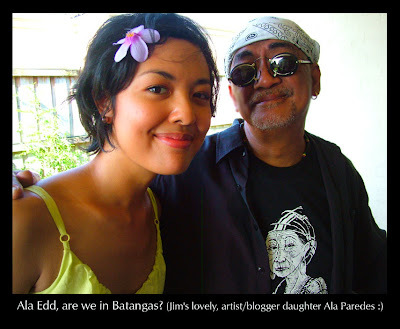 (blog update Sept. 09, '09) Interesting article from Banggaan buddy Claro Cortes IV about significance of today (at the end of this blog entry). Holy Novenary! Was it 9 p.m. on the 9th of September of 1979 and when there’s about 9 more animation frames to finish? ..and it was hot and that old wall air conditioner sounded like a broken rotor blade. 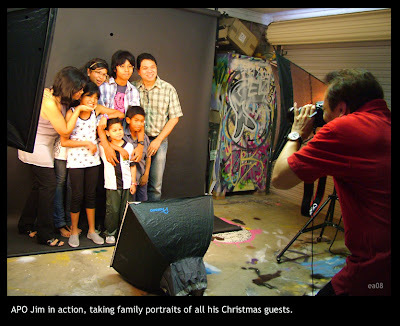 Yep, at that time we were in an animation film studio set up by Nonoy Marcelo for television projects of Imee Marcos. 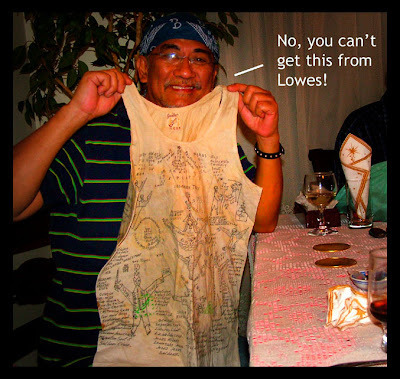 One thing I truly remembered (and believed was totally irrelevant to producing animated films) was when my late marital godfather Nonoy walked away laughing after one of the animation in-betweener guys rotated his unfinished plate of Lambat Restaurant morsels. 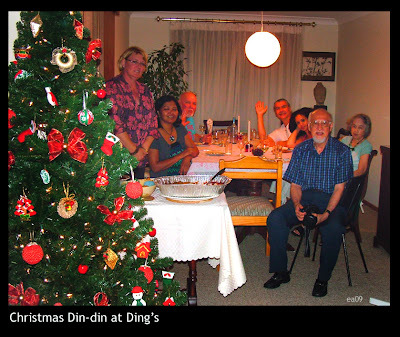 Well, you know, old school Filipinos do that every time one has to leave the food table while the rest still partakes. I still vividly hear his voice: “Malas raw ang maniwala sa pamahiin!” (They say it’s bad luck to believe in superstitions!). Then quiet. We were waiting for his punchline.. we then realised that was the punchline! We were rolling all over the cel-covered floor. Oh how I miss Ninong Nonoy’s simply-Matisse-like wit that only supplemented his artistic and literary genius. 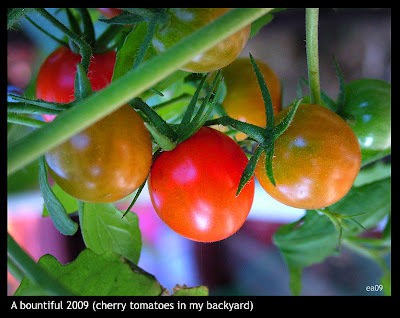 Oops, before anything else, Happy 2009 readers! Still have that nagging apprehension how the year’s going to treat us? Will it be good luck or bad? Well if we should need some trivial guidelines, the horses have already bolted 9 ends-of-the-world ago (that was 9 layers of extreme and climactic earth upheavals detected from deep-drill ice tubes taken from the Antarctic). Now if we have to refer to the Chinese calendar and numerology, then it’s lucky! Nine (pinyin jiǔ) is considered a good number in Chinese culture because it sounds the same as the word "longlasting" (pinyin jiǔ). For an added tikoy of a bonus, it's also the Chinese year of the Ox on our Pinoy faces (Whaa..they’ve included me for I was born in fortyNINE!) It’s going to be lucky for the 9 dragons of Kowloon though; but do I hear “Hey what about us Filipinos; what’s in store for us in ’09?” Will it be a year of oxtail kare-kare? Ssssh, my friend, take a deep breath...ahh..let the prana out...let go..and let the superstitious take over the planet; otherwise the dragons shall breathe fire and melt your 9 Ghz hard disc. 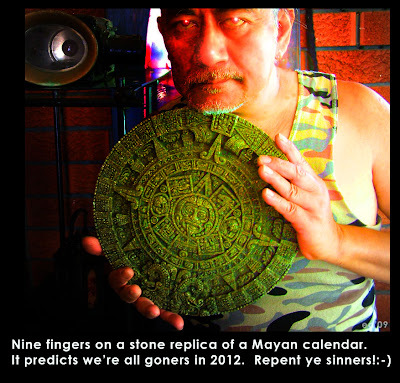 But this is scary..according to the Mayan calendar, we will be just 3 years away from the End of the World (2012)! Damn! I still have to finish that 5-year painting! The way I look at it, early scientists, mathematicians and engineers (sometimes they are all one and the same) should be blamed for all superstitions known by Man. Hey check out those Aztec guys whose calendars were so precise, all encrypted and carved in stone. I pondered, when the Moon struck 8 pm, i.e., when the horizon and earth’s first satellite cross-haired in that little Aztec adobe window, it’s time then for Montezuma, the ninth Aztec emperor, to chew his coca leaf, perhaps to make Mrs. Montezuma happy; thereafter the next morning he could announce to his wretched proletariats that they could sow their wild corn oats on the ninth appearance of the moon to avoid damaging frost.. but wait.. like any mail-order product tv barker will say.. there’s more! They have to sacrifice nine virgins on the ninth week! And only then shall the land be rich with nourishing protein from the red liquid that flowed down the Holy Stairs pyramid. If your Chinese friend tells you that Nine is Purity, is he being superstitious? Not really. It’s scientific. Nine is a method of grading purity of fine precious metals; e.g. platinum, gold and silver which is based on millesimal system of fineness (a metal is said to be one nine or one nine fine if it is 900 fine, or 90% pure. Mathematicians! Oh how I despise mathematics but I couldn’t live without it. See the very computer I’m using to write this article down relies on Nine! Uptime is a measure of the time a computer system has been "up" and running. Similar to the unit of metallic purity, "Five nines" means 99.999% availability, which translates to a total downtime of approximately five minutes and fifteen seconds per year. It is often used as a measure of computer operating system‘s reliability and stability, in that this time represents time a computer can be left unattended without crashing, or needing to be rebooted for administrative or maintenance purposes. Conversely, long uptime can indicate negligence, because critical updates can sometimes require reboots. Here’s another superstition.. they say if you’re using a Mac, it could be a different story! :) No more frequent crashes and rebooting! Waah I want my MacPro! How do Toyota makers perceive 2009? Well,with the current recession and stagnant car sales, it’s no wonder the Japanese consider 9 unlucky because it sounds similar to the Japanese word for "pain" or "distress" (kunrei ku). Arigato Wikipedia-San. Relax, it’s not all bad luck. And don’t be turned off by Anton LaVey who applied the number to Satan. He’s the guy who authored the Satanic Bible. Struth! I reckon he’s got a big eeeee-go! Get a life, man! Religions also have knowingly or unknowingly revered number nine. Are you Hindu, hindi? (no?) 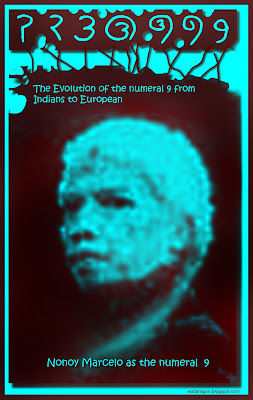 Well if you are, you might as well consider numeral 9 as a completely divine number because it represents the end of a cycle in the decimal system, which originated from the Indian subcontinent as early as 3000 BC. Now that’s old! Oh you’re a Buddhist? Well you’ll have to email and eyeball 8 other colleagues because your rituals usually involve nine monks. Nine is a significant number in Norse Mythology. 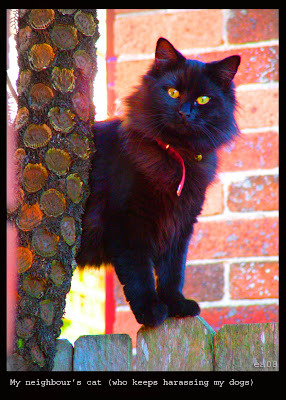 Odin hung himself on an ash tree for nine days to learn the runes; which reminded me of a Banggaan yahoo art group member who did the same (hanging by his toes unaided) up on a torii (Japanese gate) for about 9 minutes. Really! Oh and if you’re a Pinoy Muslim, you would of course know that the Ramadan is ninth month of Islamic calendar. And so that was the year that was, we’re on the move now..listen..there’s John Lennon repeatedly calling number nine while I play Revolution 9 of their White Album. For the President-elect Obama, it’s time for change after being punished by 2008! 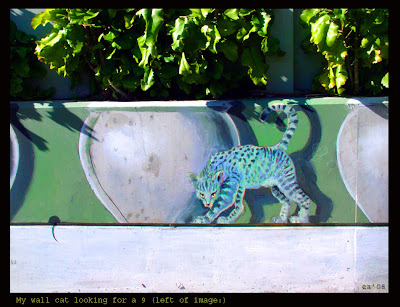 Believe it or not, Robert Ripley said "A cat-o'-nine-tails suggests perfect punishment and atonement." find it in the spiral of life itself whose signature is still intact from an extinct ammonite to a humble cartoon of 9 as a big headed, intellectual man (unlike 6 with a heavy stomach:) which could stand and balance itself, thrown in the air and still landing on its feet like a feline with 9 lives. 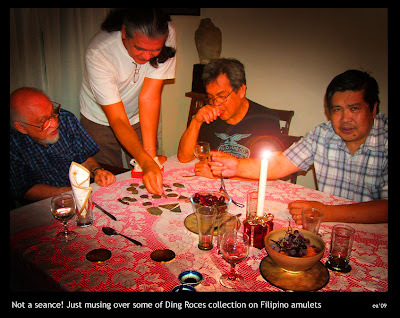 Before the year ended, this writer was at Jim Paredes' place on Christmas Day and just about New Year's Eve at Ding Roces’ abode whereupon after a lovely dinner he showed us his collection of superstition-empowered metals! 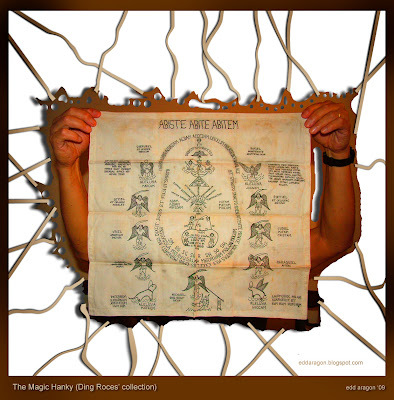 They were beautifully stamped or crafted anting-anting (amulets). There were books and shirts where Latin words were written. And did you know that number 9 is used to translate Cyrillic to Latin? To end this blog entry, here are some good moments in Manila last year. Goodbye '08! I enjoyed your ruminations on nine and your kwento about Nonoy ad the good old days. Love the pics of me and my family too. Thanks. 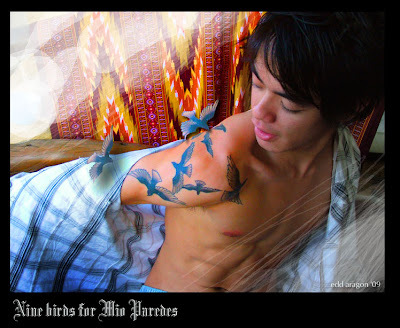 love what you did with mio's tatoo!